Winter trimmings and regulatory cement. Does healthy come in one size that fits all? Are you a flexitarian or an omnivore? Getting the most out of nutrition stats. Healthy means one thing to cooks and something different to a recipe analyst like me. Here’s the secret to a great ratatouille. Here’s why indulgence has a place at my table. Reducing a radiantly complex plate of food down to a couple of nutrients is insane. Rethinking healthy starts with rethinking nutrients. Will 2018 be the year I can finally eat healthy? Do we need a food based nutrition label? I’m a realist when it comes to brocolli. Here’s why. Some folks follow recipes as if they were set in regulatory cement but that’s not how I like to do things. Too rigid and inflexible. It’s just more fun to take the structure of a recipe and adapt it to my own situation using the recipe as a guiding principle. Here’s a picture of the last bag of my winter trimmings. Red onion skins, some winter greens, storage carrot ends, portobello stems and gills predominate. This batch has been accumulating over a month or so during which I gathered trimmings and stored them in a 1 liter freezer bag. Batches of trimmings vary through the year. More in the winter than the summer. Different mixtures depending on what I’m cooking. When the bag is full, I put about 1/2 liter (2 cups) in the bottom of my steamer and put the frozen trimmings in the steamer basket. The brew steams slowly and the trimmings release their pigments and essence into the water below. After an hour or two, I press as much liquid as I can out of the vegetable trimmings and put the remains into my food scraps recycle bin. Then I strain the broth, transfer the beautiful aromatic amber liquid into containers, and store in the freezer for use over the next couple of weeks. 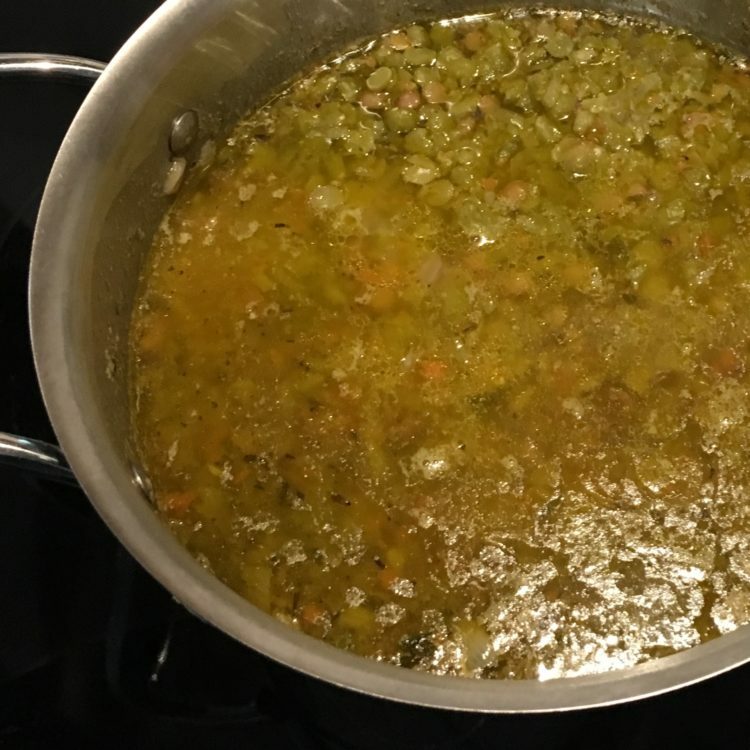 The first time I made a vegetable broth, I consulted a couple of online recipes along with any guidance from my cookbooks, picking up a suggest here and a tip there. Over the years, I’ve established my own rhythm and learned through trial and error. No cauliflower stalks but kale stems or broccoli stem skins are okay. Always carrot ends and peels. And I especially love onion skins both red or white because they contribute such amazing pigment colors. Making my own no bone vegetable broth is satisfying for many reasons. It’s clean. So clean in fact my broth beats even the cleanest labeled commercial brand. No waste. Food scraps get repurposed then recycled. No salt. Not because I don’t like salt but because I use the broth in cooking and each dish is salted to taste during preparation. Never boring. Each time I make up a batch, the flavor and even the color changes according the selection of trimmings that went into the freezer bag. Using a recipe as a guiding principle works so well and is how most folks who like to cook use recipes. Cooking is a creative process and the recipe becomes a structure that can be adopted and evolved depending on location, season, custom, and taste preference. So why not use the same logic for dietary guidelines? I just wish it were that simple. Over the last 3 decades each time there’s a new release of dietary guideline, institutions implement those guidelines as one more layer of regulatory cement. Those layers of cement has been accumulating now for decades. Absolute compliance takes precedence over location, season, custom, and taste. Trusting folks to use dietary guidelines as guiding principles might not produce better results than regulatory cement. But wouldn’t it be interesting to see what would happen if humans were actually allowed to make our own judgment calls? When it comes to automobiles, maybe we could get by with one size fits all. Wasn’t it Henry Ford who said we could have any color you want as long as it’s black. But imagine how miserable we’d be if everyone had to fit their feet into the same shoe size? Now there are some obvious differences between food and shoes. But when it comes to size and shape, food and shoes have more in common than you might think. Consider this recent dinner I put together. A modest piece of beef tenderloin. Sliced savoy cabbage, shallot, and green peas braised in olive oil and stock. Steamed Yukon gold potato. Add a Guinness stout to accompany the meal followed by fresh pineapple, a couple of walnuts, and a small square of very dark chocolate. Et voilá. A plate that manages to be non compliant with every healthy dietary model. Compared to Dietary Guideline recommendations, my plate falls short. No bread or rice or pasta on the plate. A beer instead of a glass of milk. And too many calories from fat (>35%) and saturated fat (>10%). Vegan activists will come after me because I put a piece of meat on my plate. Keto enthusiasts love no carbs on the plate but will ask why no cream or butter or coconut oil. Globalists who promote the planetary health or flexitarian diet, will be upset because my serving of beef is so big, my serving of nuts is so stingy, and there’re no whole grain. It used to bother me that my usual pattern is non-compliant but I’m getting more comfortable with the idea. Being out of step with a vegan or Keto approach is one thing. Being out of step with dietary guidelines or planetary health is quite another however. Why was I bothered? Because I’m a nerdy dietitian who studied nutrition, appreciates the need for evidenced based science, and supports the concept of a healthy eating pattern. But my numbers still never fit a conventional model. So that brings me back to shoe sizes. Before industrialization, if you were lucky enough or rich enough to own a pair, your shoes were custom made. In today’s world the best a shoe manufacturer can do is offer many different sizes and styles. Then it’s up to us, the shoe wearing public, to find shoes that fit. Maybe that same logic works for food choices too. As a committed omnivore in love with all things vegetable, fruit, legume, and whole grain, my pattern has fewer carbohydrates and more fats than the one size fits all dietary guidelines. And if I think about guidelines as guiding principles instead of regulatory mandates, my pattern looks a lot healthier. My doctor is okay with my health stats. And my gut is happy with my food choices. So I’ve decided to stop being bothered because my pattern is not a perfect fit. So you see, finding the right dietary pattern really is like shopping for shoes. You keep trying on different patterns until you find the one that’s the best fit for you. Flexitarian and omnivore are two words that describe the eating pattern of someone who eats plant based and animals based foods. Flexitarian is a new word. It’s a neologism coined in the early 1990s by putting two familiar words together – vegetarian and flexible. Omnivore is an old word. It’s descended from the Latin omnivorus via French into English probably during the 19th century and used to describe a person who eats both plants and animals. If you had asked me a month ago if I were an omnivore or a flexitarian, I would have said both. Lots of vegetables and fruits and legumes and nuts and whole grains and smaller portions of meats or poultry or fish or cheese have always been part of my usual pattern. Something happened recently, however, that caused me to change my mind. The EAT-Lancet report was released last month. This report champions a planetary health diet and a flexitarian dietary pattern. The report is the result of a three year effort and reflects the work of many international experts. Described as a dietary approach that promotes both the health of people and the health of the planet, the flexitarian pattern that emerges is largely plant-based but includes small amounts of fish, meat and dairy foods. Links are provided for those of you who want to read the report and the summary for yourselves. Now getting more fruits and vegetables and legumes and nuts and whole grains on the plate is a great idea. But the flexitarian pattern proposed in the report is not a pattern I want to follow and here’s why. Like so many diet plans, the guidelines are not flexible and virtually eliminate whole groups of foods. Many fashionable diets reflect rigidity. Keto eliminates carbohydrates. Fat Free eliminates olive oil and avocado and nuts. There are plenty of vegetables in the planetary health diet but I don’t see a lot of flexibility for animal based foods. Like whole milk yogurt. Or a cheese omelet made with eggs from pastured hens. Restricting personal choice and spontaneity and surprise takes so much of the joy out of eating. Saving the planet is a goal most of us support. It’s just not clear to me however why a piece of farmhouse cheese from grass fed cows is a worse choice for the planet than an industrially produced cashew analogue made with nuts imported from who knows where. Cashew analogues are encouraged as per my reading of this flexitarian approach and whole milk products like cheese are not even allowed. Doing my own research and making my own moral choices is important and the more I studied the report, the more inflexible and dogmatic the flexitarian pattern sounded. Shopping and cooking are fun. At least for me. Experimenting with new foods and exploring new places and learning new techniques are part of the adventure. Food should be celebrated and, all due respect, I found the report lacking in joy and spontaneity. Time for reassessment. Maybe I’m not a flexitarian after all. But does that make me an omnivore? I went out looking for confirmation and found myself on Michael Pollan’s website. No other food writer is more closely associated with the word omnivore than Michael Pollan. He wrote The Omnivore’s Dilemma about a decade ago and penned that famous dictum: eat food, mostly plants, not too much. He is not, or at least he was not at that time, vegetarian. Here’s how he phrased his response. Makes perfect sense to me. Exactly the path I’ve followed. Making peace with the messy realities of eating animals is necessary. My way of making peace is to support small scale agriculture, humane treatment, and pasture raised meat, dairy, and cheese. I understand this pathway is not for everyone and honor the personal choice of others. The recommendations in the EAT-Lancet report hit me as rigid, dogmatic, and austere. I feel the writers are mandating a course of action and are not in the mood for compromise. I’m not expecting the flexitarian movement to honor my personal choice, but I’ve decided to keep my mind open and hope for a pleasant surprise. I love to eat and I love to cook, but when I’m not in my kitchen cooking up a storm, I’m sitting at my desk running nutrition stats. My clients are editors for website recipe collections and cookbooks. The preferred format is a listing of nutrients per serving which roughly match the Nutrition Facts Label. Like my colleagues who work in the consumer packaged goods industry, I’m dedicated to providing the most accurate analysis possible given the vagrancies of ingredient data sourcing and the lack of clarity in certain ingredient listings. I’d like to believe cooks, recipe developers, and consumers pay as much attention to the stats I produce as I pay to accuracy. But I have my doubts. The label as currently formatted is hard to understand even for me and I’m an expert. The data is good but the format is dense and unfriendly. As one perceptive observer has said, the current label is still a work in progress. The current nutrition stats approach sends a message that healthy can be reduced to a couple of nutrients. That is not a helpful message. However, nutrients remain important and the stats work well to size a portion or to calculate a ratio. Research on new formats in this country and elsewhere is ongoing and it’s likely we will see a more intuitive, interpretive, or holistic format at some point in the future. But for now we need to use what we’ve got, so let me share with you some observations. Rigid calorie counting is out, but portion sizing is always useful for individuals. I know for example that a 600 calorie plate is plenty for me. I do enjoy meals over 1000 calories from time to time. Sometimes a lot over but I need a good reason. Like a celebration meal or dinner out at one of our favorite Manhattan restaurants. Calories are my metric of choice for portion sizing. Very useful when scanning a restaurant menu or for assessing portions for a new recipe. Ratios are a quick and easy way to compare two nutrients. And because a ratio is not dependent on a serving size, a ratio remains constant regardless of how much or how little ends up on the plate. • Calorie Density. The calorie to gram ratio tells you how many calories per unit of weight. Cookies have a high calorie density where as a mixed greens salad olive oil & vinegar dressing has a low calorie density. • Salt. The ratio of sodium to calories is an easy way to determine sodium concentration. This ratio is especially useful when you check out a packaged product or a restaurant menu item. Canned soups have a high sodium ratio. My homemade legume soup has a lower sodium ratio. • Fiber. The fiber to carbohydrate ratio helps you figure out if a product or a menu item is a good source of fiber. 100% whole wheat bread has a high ratio for fiber. Pop Tarts have a low ratio. • Healthy Fats. The fatty acid ratio tells you which fatty acids predominate. Unsaturated fat is considered healthy but the status of saturated fat remains controversial. I prefer whole milk to skim milk and always choose whole milk yogurt and cheese. 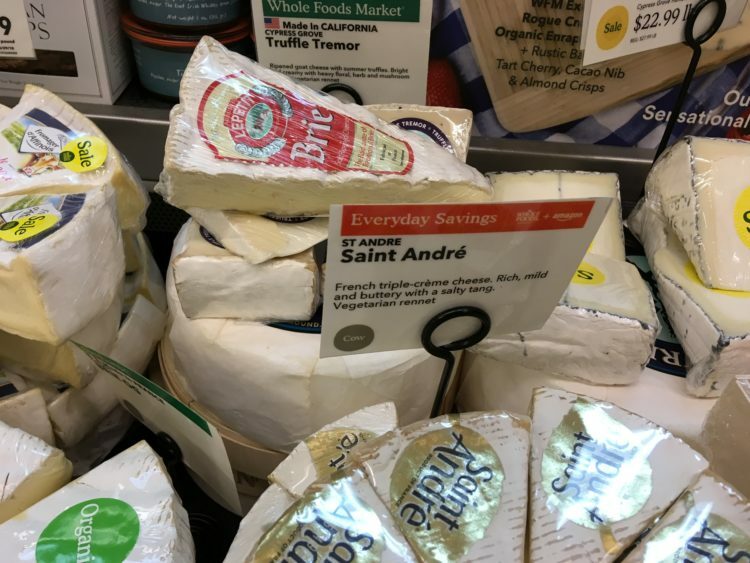 Many nutrition researchers and dietitians recommend limiting saturated fats as do the current dietary guidelines, but I continue to opt for a good honest cheese like the St André pictured above. The next generation of nutrition labels will be more personalized and more intuitive. We will probably see more color coding and more logos. This type of labeling is already being used in some European and South American countries. In the meantime, nutrient ratios, calories per serving, and lots of good old fashioned common sense are out best option. Feast your eyes on a gorgeous Brune Landaise, a slow grow (110 days) heritage breed chicken raised in rural Pennsylvania. I took the picture recently at a Manhattan restaurant and even with the addition of vegetable sides, it’s not your classic picture of healthy eating. HEALTHY MEANS DIFFERENT THINGS TO DIFFERENT PEOPLE. Roast chicken is a healthy alternative for carnivores when they get tired of steak. If you’re a vegan however roast chicken is unhealthy or immoral. And probably both. These are subjective opinions based on two different belief systems. Enter the nutrition researcher. These folks have been taught to measure healthy in grams and milligrams. Personal anecdotes and opinions are suspect. Research and evidence are what count. Now the scientific method is by natures reductionist and that’s not necessarily a bad thing. The problem is that scientists sometimes forget that the whole can be more than the sum of its measurable parts. And so sometimes do recipe analysts. 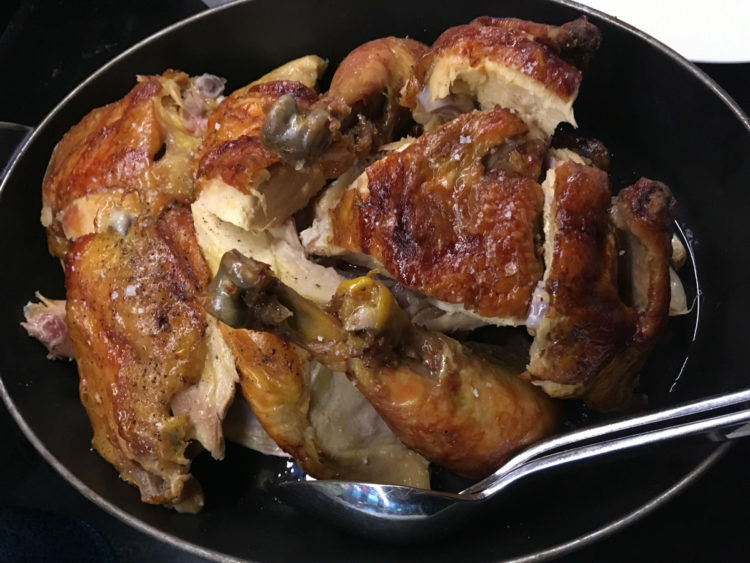 I ran the numbers for roast chicken based on my own recipe for a modest serving size (2 pieces or about 6 ounces). Calories 370, Fat 22 g, Saturated Fat 6 g, Sodium 560 mg, Carbohydrates 0 g, Fiber 0 g, Sugars 0 g, Protein 39 g.
If you have a hard time finding meaning in the numbers, you’re not alone. I know what all the numbers mean, I’m a dietitian, and I have a hard time too. Facts are important and we don’t want to ignore them. But nutrition researchers are coming to realize, facts are not enough. My most brilliant research colleagues are currently doing just that — developing algorithms for putting the parts back together. Similar research is going on in Europe, South America, and Australia. Chefs and home cooks and food writers know intuitively that food is more than the sum of its nutrient parts. Nutrition researchers and dietitians and recipe analysts dedicate their lives to understanding those nutrient parts. Both perspectives are valid. But that hasn’t made it any easier for cooks and recipe analysts to discuss what’s healthy and what’s not healthy. Here’s a small taste of what lies ahead for recipe and menu analysis when we widened the lens and look at food through both perspectives. Using a narrow lens, roast chicken isolated and alone provides excellent protein but comes with saturated fat. My zealous colleagues, with the best of intentions, solved the problem by removing the skin. As a result, skinless boneless breast became ubiquitous. When we widen the lens by adding a green salad, two vegetable sides, a piece of French bread, and a glass of Bordeaux, the dynamics change. The same excellent protein remains, but now we find 40% that plate is vegetables and those grams of saturated fat are nicely balanced by unsaturated fatty acids. A hybrid perspective meets the objective demands of the analyst. Being a dietitian by trade but a foodie at heart, I find the hybrid perspective helpful because it more reflects my standards of healthy better than a more narrow reductionist view. Only time will tell however if a hybrid perspective will be useful to chefs, home cooks, and food writers. Every August I make ratatouille. Zucchini is still coming in. Tomatoes and peppers are bursting on the scene. Fresh garlic and fragrant basil are in season and abundant. I made my first ratatouille to rave reviews using a Julia Child recipe. Her version was spot on because she knew the secret so I just did what she said and used a generous hand and the best olive oil I could afford. Julia made her mark in the 1960s and 1970s so she missed a head on collision with the fat phobic era that gripped our nation starting mid 1980s. DECADES OF FAT PHOBIA IMPACTED RECIPE DEVELOPMENT. By the time I went back to school to study nutrition in 1993, low fat was firmly entrenched. Manufacturers had already jumped on this bandwagon as noted in an article from 1993 in the The Washington Post. It took a little longer for recipe modification to take hold however. In October 1998, Eating Well a magazine dedicated to healthy eating published a recipe for ratatouille. Enough olive oil was removed to get the calories from fat down to 33%. In other words about half the amount of olive oil as Julia called for in her recipe. The most austere recipe I pulled up searching for low fat ratatouille was from 2008. This recipe substituted cooking spray for olive oil and successfully reduced the calories from fat down to an austere level of 10%. LOW FAT HITS VEGETABLES ESPECIALLY HARD. That’s because vegetables by weight are mostly water and water has no calories. Vegetables have lots of positives like fiber, some protein, sometimes sugars, and a rich array of vitamins, minerals, pigments, phytonutrients. Just not many calories. Fats like olive oil are calorie dense so when the oil gets added to eggplant, zucchini, peppers, and tomatoes — all of which have practically no calories — of course most of the calories will come from fat. A well crafted ratatouille clocks in between 60 TO 70% calories from fat. WE NEED A BETTER SCORING SYSTEM. So I decided to keep an eye out for a better scoring metric. I discovered some research done at Oxford a decade or so ago that counts both negatives and positives. Then I adapted this approach to my own recipe analysis. Ratatouille tastes much better made with salt (40% sodium) and lots of olive oil (13% saturated fat). Sodium and saturated fat currently count negative. Ratatouille is mostly eggplant, zucchini, peppers, and tomato by weight (over 90%). Vegetables, protein, and fiber currently count positive. The negatives are about equal to the positives with a slight edge to positives and that sounds healthy to my simplistic mind. AUGUST IS MY MONTH FOR CELEBRATION. August is the optimal month for ratatouille. August is the month Julia was born. And August is the month I finally figured out how to score ratatouille healthy. There are so many classic recipes for ratatouille available via the internet. You can find Julia’s recipe here. And Alice Water’s recipe here. And the recipe from The Kitchn here. Or you message me via LinkedIn or Facebook and I’ll send you my recipe. An omelette is my go to meal when I’m hungry, pressed for time, and feel like indulging myself. Pictured above is a quick and dirty meal I put together a couple of weeks ago. Bitter greens and cannelloni beans mixed with calamari, restaurant leftovers from a meal the night before, filled up half the plate so all I did was make the omelette. First cholesterol and now veganism. Since the 1970s, we’ve been told to avoid foods high in cholesterol and egg consumption has taken a major hit. In 2015, cholesterol was removed as a nutrient of concern and the 2015 Dietary Guidelines say eggs are now okay with this disclaimer. Eggs like all animal based proteins should be consumed in moderation. Vegans take that advice one step further. “Eating an egg is as bad as smoking cigarettes.” That claim was made in a recent Netflix movie funded and produced by folks promoting veganism. What the Health got mixed reviews but vegan messaging tends to be aggressive and the message is clear — eating eggs is not okay. Does anyone think eggs are healthy? An Organic egg farmer in New Hampshire recently filed a citizens petition asking the FDA to allow them to label eggs healthy based on the revised guidance issue by the FDA. The petition points out that the fatty acids in an egg are predominantly unsaturated. Eggs do have an impressive nutrient profile. Excellent protein with all essential amino acids, a favorable mixture of saturated and unsaturated fatty acids, and a very impressive list of micro- and phyto-nutrients. So what is it — are eggs healthy or unhealthy? Here’s the problem. Eggs are a mixed bag and making an omelette with butter or oil and salt adds more variables to the bag. My omelette has strong positives. Complete protein plus all those other micro nutrient benefits. And my omelette has strong negatives. Saturated fat, calorie density, and sodium. Here’s why I use the word indulgent. Swinging back and forth from one extreme to the other is not helpful. We need a better approach. Some kind of hybrid system that scores the omelette as a whole. Towards this end, an approach developed in the UK and recently implemented in France has potential. The metric is weight based and positives are balanced against negatives to come up with a single score. I’ve adapted this approach for recipe analysis. When I ran the numbers, my omelette got more negatives than positives. Actually got a lot more negatives than positives and that’s why I use the word indulgent. Some final thoughts on healthy. • Nutrition research is constant and ongoing. Saturated fat and sodium score negative because current guidelines from both the US and EU recommend moderation. Both nutrients however remain controversial in some research circles. Especially the complex issue of saturated fats. • Ingredient quality and degree of processing aren’t scored. Pastured local eggs, California certified olive oil, and home cooking add value for me but are not part of the scoring metric. And because I value home cooked from whole minimally processed foods, delicious indulgent is okay at my table as long as I source my own ingredients and make it myself. 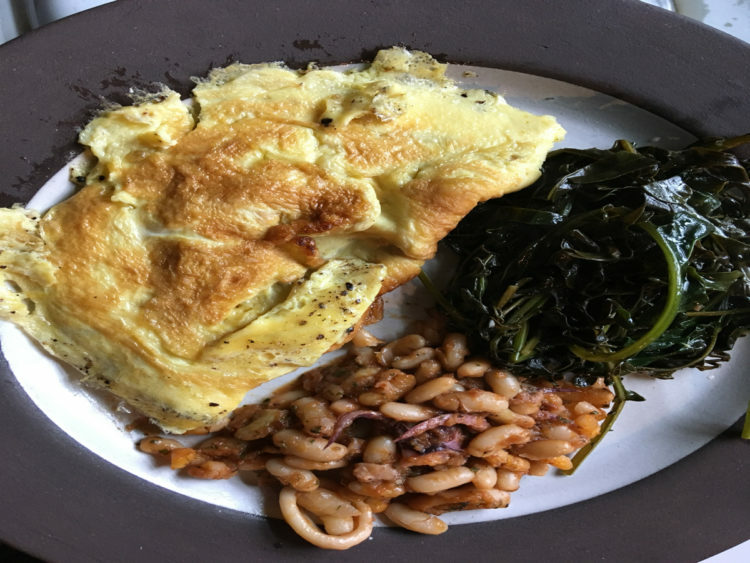 • Putting my omelette, or any other meat based protein, on the same plate as greens and legumes makes the whole plate healthier. That’s not to say that nutrients aren’t important. Because they are. They’re very important. But nutrients are only one of many parts to a complex story. Take my beautiful salade composé pictured above. There is so much more going on than a string of numbers can communicate. First take a cold hard look at that small little subset of information called nutrition facts. 660 calories, 48g fat, 8g satfat, 660mg sodium, 30g carbohydrate, 8g fiber, 6g sugar, 26g protein. It’s hard to say whether that string is healthy or not. My first though is always that I need more information. Without checking the ingredient list and without the picture, there’s no way to tell what foods are on the plate. AND NOW FOR THE REST OF THE STORIES. Every recipe has a story to tell. Even when as is the case here, there was no recipe. Its confession time and that means I’ll have to admit that I didn’t actually follow a particular recipe. I followed a pattern. For those who feel more comfortable with a recipe, however, there are hundreds available via a google search. When I put a salad like this one together, I use what’s on hand. Each salad is different. Depends on what’s is the frig, how big the plate is, what’s in the pantry, how creative I am feeling, and who else will be sitting at my table. Some recipes have a backstory, but I checked my Larousse Gastronomique and all I could find was the fundamental distinction between tossed salad versus composed salad. Tossed gets well tossed. And composed just sits. Timing of the dressing is the same in both cases, just before serving. Every ingredient has a story too. 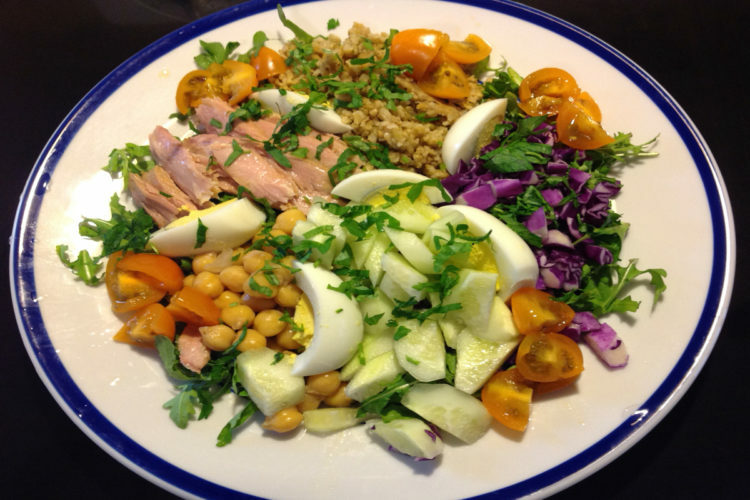 Pictured above are arugula, chickpeas, tuna, cucumber, tomato, egg, farro, red cabbage, parsley. All artfully arranged or “composed” on plate and dressing with a classic vinaigrette. Where were the chickpeas sourced? Canned or home made. And how were they grown? Organic. Conventional. Regenerative. And how about how old are the chickpeas because age really does make a difference when you’re cooking chickpeas from scratch. What about the tuna? Is it domestic or imported. Line caught or net caught. Skipjack or yellowfin or albacore or one of the lesser known species. Jared or canned or fresh. Just for the record, the tuna pictured above is Tonnino, a branded product packed in Italy. What about the vegetables? Where were the cucumber, red cabbage, and parsley, tomato grown. Organic. Regenerative. Conventional. Local. How long they kept in storage before hitting the supermarket shelf or were they picked up that day from the farmer’s market. Are the eggs from pastured hens or caged hens? Is the farro imported Italy or home grown in the US? Is the vinaigrette classic clean home made or an off the shelf branded? Governments have been slow to act but most home cooks, chefs, and foodies already know food counts. Perhaps that’s why this group tends to pay so little attention to what the government does and does not say about healthy. Other countries has been more aggressive with consumer package goods labeling than we have been. The Brits worked out their traffic light system of food labeling over a decade ago. The Australians implemented their Health Star Rating System a couple of years ago. But the real breakthrough came last year when the French government approved a voluntary front of the packaged label Nutriscore that actually counts food in the calculation. AND WHAT DOES ALL THIS HAVE TO DO WITH A SALAD? While trying to reduce something as radiantly complex as food down to a couple of nutrients really is a bit crazy making, putting food back into the equation might actually work. So I began to wonder what would happen if I borrowed the French approach to consumer packaged goods and applied it to a recipe? First identify the Negatives, which do happen to be nutrients. Then identify the Positives, which are a combination of nutrients and foods. Then balance the Negatives against the Positives and assign a color coded range. Using the Nutriscore color code, my salad whole be light green. If the salad were rigidly healthy, I would could use dark green circle. If the salad were somewhat healthy, I could use light orange. But the salad is in between so it would light green circle. I’m going to call it reasonably healthy. Not sure about the FDA, but reasonably healthy works for me. How about you? Emphatically my answer is yes. An FDA mandate for nutrient claims only covers consumer packaged goods. And maybe even restaurant menu labels at some point in the future. But what the FDA decides makes a packaged food healthy permeates the general food ecosystem. When FDA defined healthy in the early 1990s as low fat and low sodium, low fat reigned supreme for a decade. Nutrients are important. No argument here on that point. As a dietitian and culinary nutritionist, I spent a couple years learning just how important they are. But so is food. And taste. And culture. And tradition. Not to mention enjoyment. So I applaud the decision to acknowledge that food is as much a part of a healthy pattern as nutrients. Defining healthy as the sum of the nutrient parts is called a reductionist perspective. The problem with a reductionist perspective. Reducing a food to the sum of its nutrient parts tends to skewer the meaning in a negative direction. Especially when, as was the case in the 1990s, healthy was defined in terms of 4 nutrients to avoid: sodium, cholesterol, total fat, saturated fat. Now feast your eyes on my shrimp and greens salad pictured above. Note the variety of vegetables on the plate: a generous handful of arugula, a dark green vegetable, some radicchio, a couple of small tomatoes, and some sliced scallions. The greens make up the bed for those lovely freshly steamed wild caught North Carolina shrimp. Remember that under the original concept of healthy, food did not count. Well, those pristine steamed shrimp are salty. All shrimp are salty. Shrimp live in the sea and the sea is salty. When healthy was measured by counting milligrams of sodium per 100 grams, shrimp are automatically knocked out. Remember too under the original concept, palatability did not count. Salads taste better when they are served well dressing, but a couple of tablespoons of fine olive oil and sherry vinegar added too much fat and saturated fat. In other words, the only way to make this plate healthy under the original concept was to remove the shrimp, hold the vinaigrette, and serve the greens naked. This reductionist view of healthy did a lot of damage. Is it any wonder so many folks rejected such a austere approach and labeling a food healthy became the kiss of death? A lot has changed since 1994. That’s the year the Nutrition Labeling and Education Act became law and the draconian nutrient content claim for healthy was cast in regulatory cement. In 2016, The FDA released a preliminary working document indicating their thinking on revising the nutrient criteria for labeling food healthy. Use of the Term “Healthy” in the Labeling of Human Food Products: Guidance for Industry. And with the release of the most current Dietary Guidelines in 2015, a healthy pattern took precedence over unhealthy nutrients. Previous editions of the Dietary Guidelines focused primarily on individual dietary components such as food groups and nutrients. … The 2015-2020 Dietary Guidelines provides five overarching Guidelines that encourage healthy eating patterns, recognize that individuals will need to make shifts in their food and beverage choices to achieve a healthy pattern, and acknowledge that all segments of our society have a role to play in supporting healthy choices. So what do these changes mean for my shrimp and greens salad? 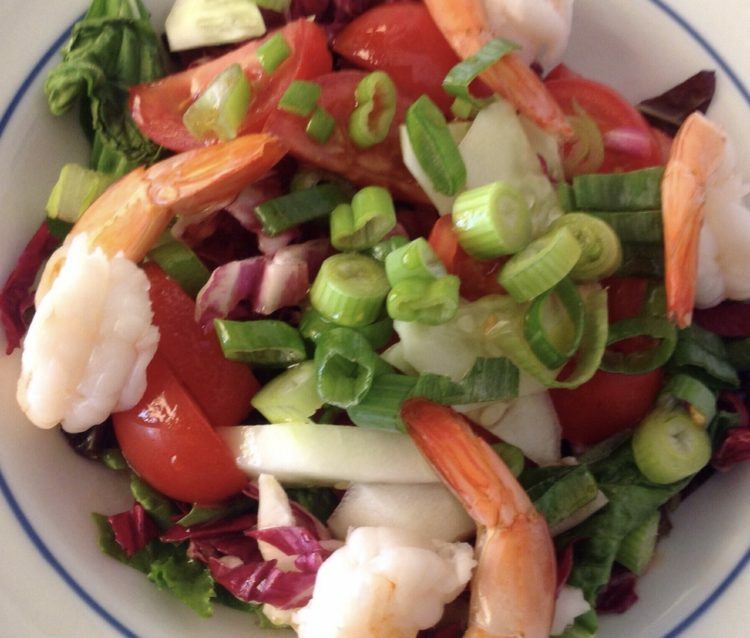 Bottom line is that my simple little salad of greens, tomato, shrimp, and vinaigrette just got a whole lot healthier. Thanks to revised thinking from the FDA, the ratio of saturated to unsaturated fats is now more important than just the grams of saturated fatty acids. 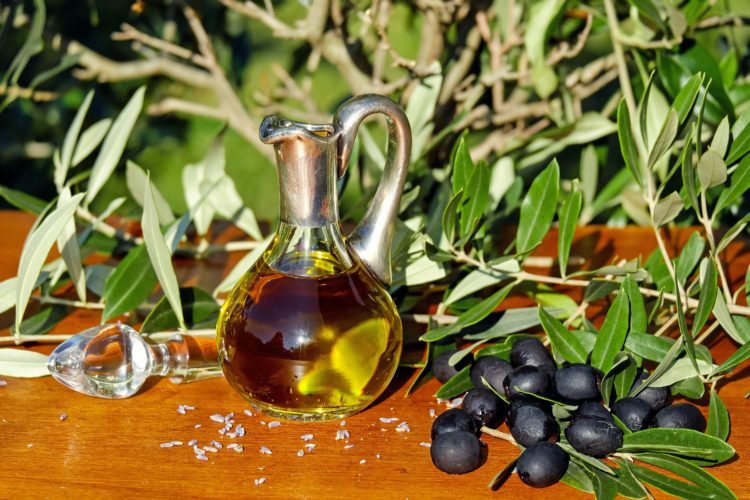 Olive oil, although it does contain a significant franction of saturated fatty acids has a stellar ratio of almost 6 to 1. And thanks to the Dietary Guidelines, the pattern and the whole plate are now important. Food counts and you get bonus points for more fish like shrimp and more dark green vegetables like arugula. We’re not there yet, but my sense is we may actually be moving in the right direction. Healthy eating has been in a state of transformation now for the last couple of years. It’s hard to date exactly when the sea change started but we’ve gradually been moving away from low fat, restrictions, and deprivations. During the 1990s healthy really was synonymous with low fat, restrictions, and deprivations. That was decade when restaurants stopped using the word because they quickly determined that labeling a new menu item heart healthy or low fat was the kiss of death. Home cooks and creative chefs have probably never paid all that much attention to nutrition guidelines and, just between you and me, I never cooked low fat at home even though I did my nutrition studies during the 1990s. But mainstream Americans embraced carbohydrates and sugar and cut out the fat. I knew things were happening in the academic community when I started seeing studies like these here and here and here. And if I were asked to provide pivotal dates, I would cite the publication of the 2015-2020 Dietary Guidelines because of the implicit acknowledgement that the sum may be greater than its individual parts. Previous editions of the Dietary Guidelines focused primarily on individual dietary components such as food groups and nutrients. However, people do not eat food groups and nutrients in isolation but rather in combination, and the totality of the diet forms an overall eating pattern. Or perhaps the FDA decision to exercise enforcement discretion as the agency reviews labeling criteria for manufacturers who want to label their products healthy. So you may be wondering what all this has to do with my lovingly prepared and very tasty chicken tagine pictured above? Well let me explain. Even by current liberalized criteria, my tagine is not technically healthy. Despite using quality ingredients and significant amount of vegetables to compliment the chicken thighs, my cooking uses more olive olive than is currently recommended. 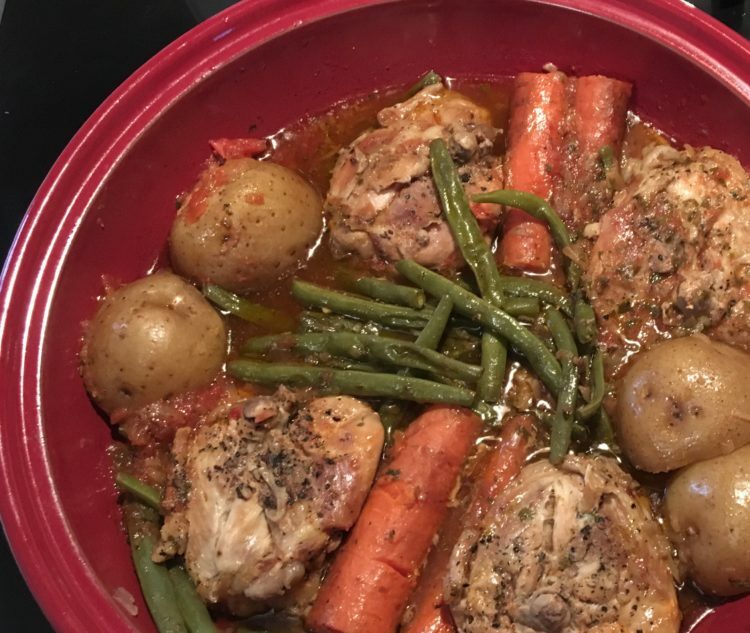 Since the 1990s when those draconian criteria were cast in regulatory concrete, many of my zealous colleagues have dutifully taken classic recipes like the one I used for the tagine and made adjustments to the proportions to restrict fat, saturated fat, and sodium. What will the new criteria look like? Hopefully a better way to asses the food and nutrition values of a dish like the one pictured above. 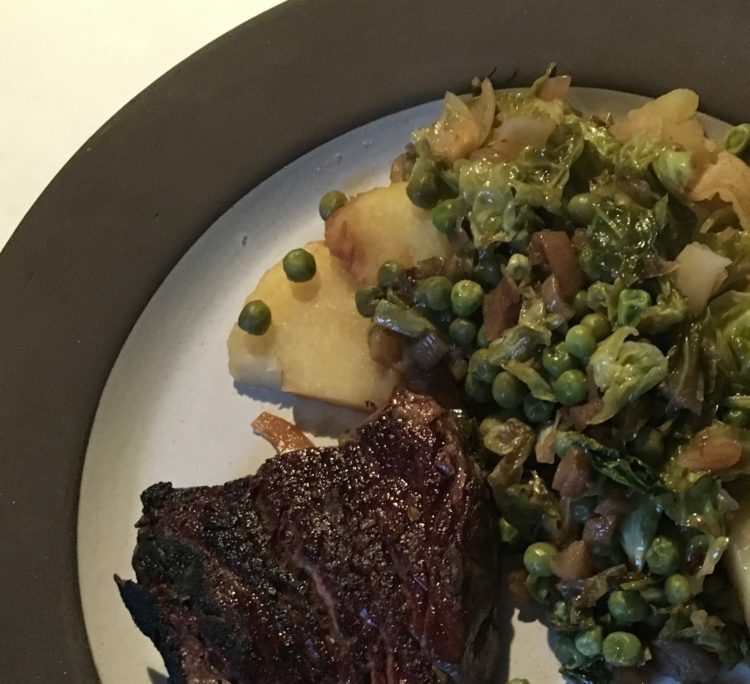 We need a scoring system that awards points for making half the plate vegetables plus positives like fiber and protein. Then we need that same scoring system to balance those positives against sodium and saturated fats.